Mark Hartley, an Australian documentarian, released the first of three prolific documentaries revolving around the world of exploitation cinema, beginning with this look at the cinema from his homeland, today known as “Ozploitation”. If many thought American exploitation films were pretty insane, they have not seen anything. 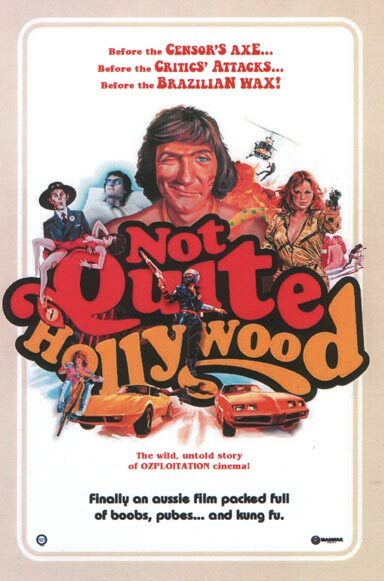 Celebrating the films of the 1970’s and 1980’s in Australia, these films would define the term “Ozploitation” with its adult themes and violent content. They even would prove to be quite daring when it comes to action and stunts. Filmmakers such as Brian Trenchard-Smith and Tom Burstall give reflections on how they would come up with the ideas for their films and the great lengths they achieved to make sure their films were not only made but successful as well. Even Quentin Tarentino gives his insights on why he loves this brand of cinema and how it influenced him to become the filmmaker he is today. Many actors and crew members talk about their experiences making these films and how the experiences, while mostly positive, do reveal some negativity as well. Such as actress Rebecca Gilling, who found it extremely difficult to work with Hong Kong action star Jimmy Wang Yu in the 1975 crossover The Man from Hong Kong. American actor Steve Railsback, who starred in the very violent Turkey Shoot for Trenchard-Smith discussed his experience on the set while co-star Roger Ward talked about an incident on the set that almost cost him his hand…literally. Stacy Keach and Jamie Lee Curtis discuss their experiences on the film Road Games, which became a hit film there despite the fact that two major Hollywood stars at the time were the lead roles. While a majority of the films discussed are from the 1970’s and 1980’s, the comeback of Ozploitation has been imminent with films such as Wolf Creek and believe it or not, the original Saw. This is one documentary that can be described as “insane, outrageous, and a whole lot of fun!” Especially hearing Tarentino’s views on the 1984 revenge flick Fair Game, as he describes not only particular scene in the film but how it reflects what Ozploitation is all about. If you are a cult film lover, then this documentary is definitely worth seeing! Magnolia Pictures presents a Madman Entertainment/City Films Worldwide production in association with the Melbourne International Film Festival Premiere Fund. Director: Mark Hartley. Producers: Craig Griffin and Michael Lynch. Writer: Mark Hartley. Cinematography: Karl von Moller. Editing: Jamie Blanks, Sara Edwards, and Mark Hartley. Next Next post: Indie sci-fi martial arts action film”Brutal” at AOF this Saturday!